Children are usually terribly afraid of dragons, or either they think that are very interesting. The fabled creative has been the subject of many children stories and this alone may spark the child’s mind to want to draw a few imaginary dragons themselves. They are not complicated to draw. It may look harder than it really is. Read on for more information. Use a pencil and a piece of plain paper. Draw a triangle (right angled). The right angle should be located at the top right of the page. The left side needs to be slightly longer than the right side. The longest line of the triangle should point down. Don’t extend the lines completely to the edge of the page. Center your triangle. This is the dragon’s face. Make a jaw for the dragon. Do this with another triangle. 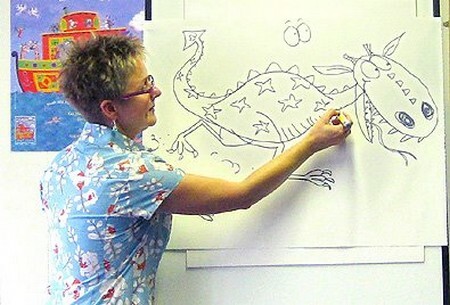 This time draw an obtuse triangle at the bottom part of the dragon’s face. There should be a part of the triangles that are shared. The longest line of this triangle needs to be on the bottom. Make a nose out of a small triangle at the end of the big triangle. Don’t draw it on the actual tip, but rather close to it. Make the dragon an ear by making a smaller triangle on the right hand side of the face. There should be triangles on all sides of the first triangle. Draw the eyes. Make a semicircle right near the ear of the dragon. Place a line in the center of the semicircle and another lien to finish the eyes of your mystical dragon. Start at the eye, make a short curve facing open ended to the top. Pull the curve down beneath the dragon’s nose. Nostrils are important if you want your dragon to breathe fire. Draw circles on the dragon. Create some dimension with your dragon by adding a lump on the triangle where the eye is. It goes on top of the eye. Your dragon needs teeth. Make them out of triangles as well. Add as many as you like. How about a neck? Make it out of two curved line. One starts beneath the dragon’s ear and the other should resemble the letter “s” and begin at the lower part of the jawline. If you want you can add spiked accents with triangles on the dragon’s head. Make some flames for your vicious animal. Enjoy.